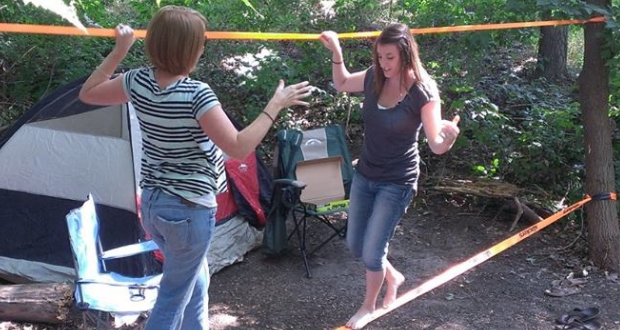 We had a chance to try out the Slackers Slackline Kit recently, and had a great time. It was easy to set up and would be a great addition to any campsite. All pieces to the kit were well made, with easy to follow instructions. 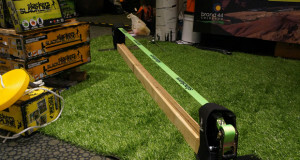 The oversized ratchet makes it easy to get the slackline nice and tight, and also makes for an easy release. The box is smaller than a briefcase, so it’s easy to toss it in the car before you head out. People will be waiting in line to try it! The tension of the line makes a big difference if you’re a beginner (like us). The tighter it is, the easier it is. The training line makes a BIG difference! Use it! We thought it was much easier with bare feet vs shoes. Make sure the grass is free from sticks and debris and make sure you have plenty of room. You’ll most likely take multiple spills while getting the hang of it. Previous: Ace Camp Kits – Making it easy for everyone!